Integrate with Salesforce to sync data and visualize it in SalesScreen. Note: You need admin privileges in both SalesScreen and Salesforce to carry out this approach. There are two prerequisites for integrating SalesScreen with Salesforce. The first one is that you need a SalesScreen subscription. The second one is that you need to have Salesforce Enterprise edition or higher in order to utilize the Salesforce API services. NOTE: If you have Salesforce Pro edition, you can get access to the API services by modifying your Salesforce plan, which is done by contacting Salesforce. This integration will not work with Salesforce Essentials edition. The integration is read-only, which means SalesScreen will only read/retrieve your Salesforce data via the Salesforce REST API, in order to visualize and celebrate it in SalesScreen. 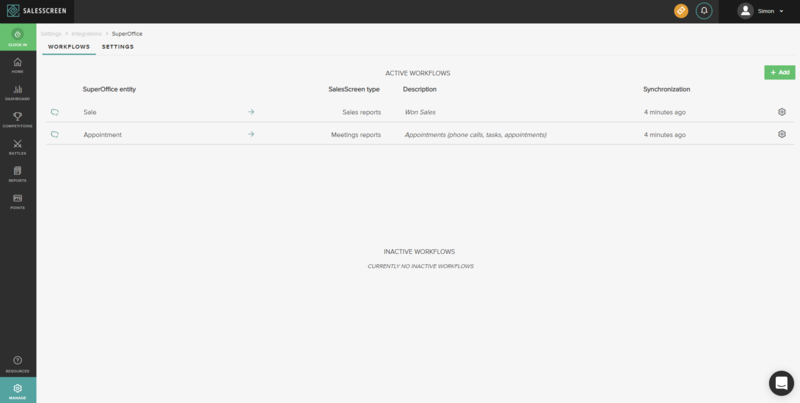 SalesScreen typically reads new or updated data from Salesforce every 5 minutes. One exception is if you decide to utilize the Salesforce Streaming API feature, which will instead push Salesforce data in real-time to SalesScreen. This feature requires SalesScreen to create PushTopic objects in your Salesforce org that are responsible for pushing the relevant data to SalesScreen. Once there, go to Integrations and proceed to click on Integrate for Salesforce. Follow the simple 3-step wizard to set up the integration. The first step will ask you to choose a Salesforce user account to act as the link between SalesScreen and Salesforce. This user account is referred to as the API user. The API user needs read access to Salesforce objects across the organization. You can simply utilize an account with the System Administrator role, or you can create a new user and/or role in Salesforce for this purpose. If you want to use the previously mentioned Streaming API feature, the API user needs certain access rights. The next step is to choose the environment of your Salesforce organization. In most cases customers utilize the Production environment (which is the default option), so this step can be skipped. If the Salesforce organization you want to integrate with is defined in the Sandbox environment, you can choose this option in the dropdown menu before continuing. The 3rd and final step is to authorize with your Salesforce org through Salesforce's own interface. We suggest that you sign out of any Salesforce accounts beforehand, so that you can choose to sign in with the API user when carrying out the authorization step. When ready, click on the Integrate button. If the authentication process is successful, you'll be presented with a list of your current Salesforce users. You can choose to import Salesforce users to SalesScreen, or map existing SalesScreen users to their Salesforce accounts. You can skip this step by clicking Continue to workflows. 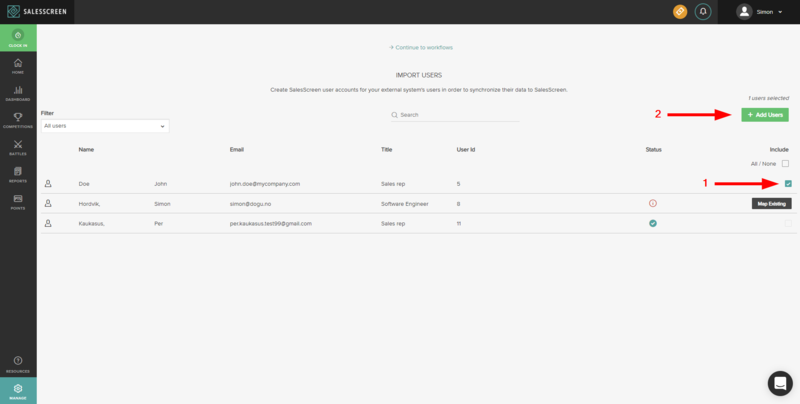 Importing of users will create SalesScreen accounts for them, where they will be mapped (connected) to their corresponding Salesforce accounts. Simply check the user(s) in the list and click Add Users. 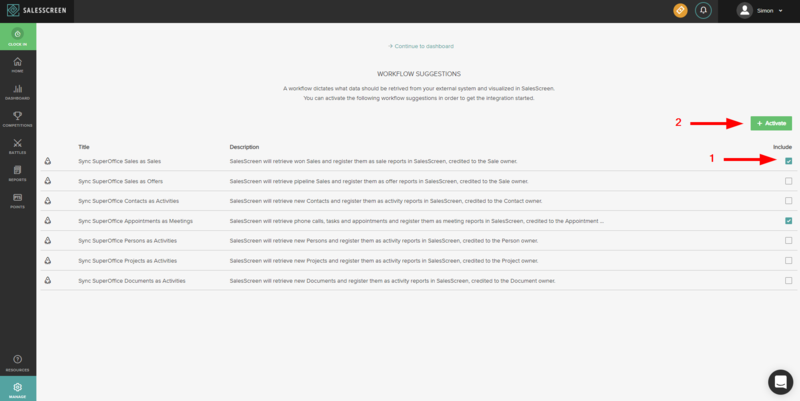 Mapping of existing users lets you connect a Salesforce user to an existing SalesScreen user due to their email or name being identical. Click on Map Existing and confirm the process. The bottom line is, SalesScreen users must be mapped to their corresponding Salesforce user accounts in order to be credited with their Salesforce activities. They must also be part of a SalesScreen team (which happens automatically when importing users). The next step gives you the option to activate one or more workflow suggestions, presented in a list including descriptions. A workflow dictates what type of data should be retrieved from Salesforce and visualized in SalesScreen. With active workflows. SalesScreen will retrieve the new or modified data from Salesforce on fixed intervals. Simply check one or more workflows from the list and click on Activate. Finally, you can click on Continue to dashboard. The Salesforce integration dashboard, showing two active workflows. NOTE: Workflows can be modified, paused/resumed and terminated at will from the Salesforce integration dashboard. The integration can also be terminated as a whole from there. Furthermore, Salesforce users can be imported/mapped as you go, and workflows can be created from scratch. Workflows can also be created from scratch.